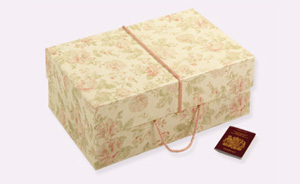 If you are concerned about how to pack your wedding dress, check-out our range of beautiful and very practical Wedding Dress Travel Cases. 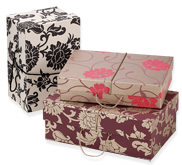 Available in various sizes, they're simply perfect to carry overseas and also suitable for storage after your wedding. • Beautifully designed and finished. • Cord handle that holds the lid as you carry the case. • Protect your dress from damage, spillages, dirt, sunlight, humidity changes and untoward accidents. • Supplied with acid-free tissue and details on how to pack your dress. • Suitable for storing your dress after your wedding - the pH neutral board protects and prevents the yellowing of the dress fabric. • The 3 sizes available fit in the overhead lockers of most major airlines (always check restrictions with your airline before you travel). For airlines with restricted hand luggage requirements. For straight, slender dresses - fits neatly in overhead lockers. requested by most major airlines (always check with your airline). The depth of the box allows for a fuller skirt and veil.